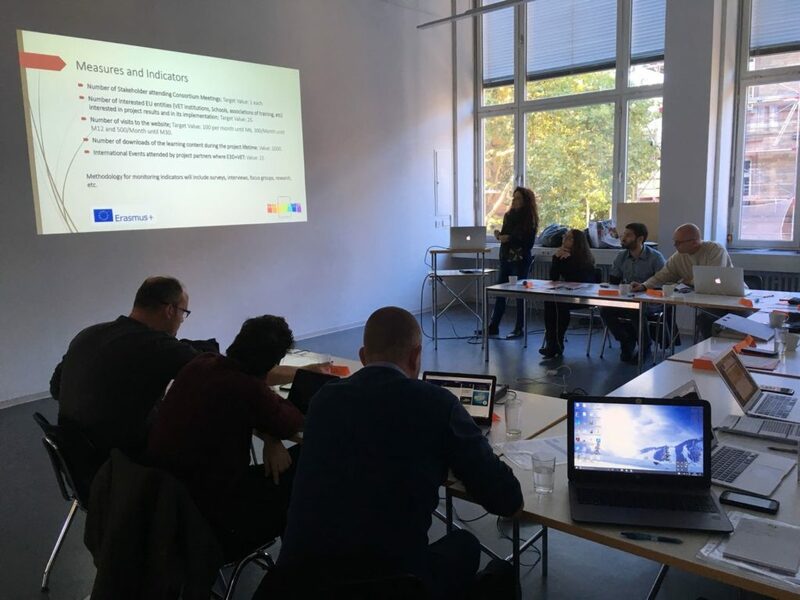 The kick off meeting of the project “E3D+VET” took place between 4th and 5th October 2017 in Karlsruher, Germany. The project, financed by European Commission in the field of the Erasmus + programme, has the aim of creating a new technology in order to improve and implement teachers’ skills for the usage of 3D printers in the schools and in the educational entities. The consortium, guided by Technological sciences Institute of Karlsruher, Germany, is actively formed by CEIPES ( Italy), SEMKA – Germany, Spain, PRISTALICA – Spain, STP – Slovenia. During the meeting, apart form the presentations of all present organizations and of the principal objectives of the project, all outputs that will be created during all 30 months of the project were presented. Among them we can find the constitution of a methodology useful to define exercises that will be used by teachers and that will be 3D printed. Therefore, 25 exercises will be realized. Didactic material will be then uploaded on an online platform that will be realized for this scope and that will contain a section dedicated to experts in the field and an area that will collect all information about 3D –specialized- production enterprises. Moreover, platform will host video-tutorials that teachers will use during training sessions. The three above mentioned outputs will be used during the implementation phase of the pilot course, during which CEIPES will be the leader organization. Together with a Palermitan Technical Institute, CEIPES will organize workshops for students using formal and informal activities. During piliot session, students will be able to use outputs and to develop new 3D printed exercise thanks to the acquired competences. Moreover, new webinars will be recorded in order to promote project and create dialogue for the use and the potentiality of 3D printers. Apart form increasing teachers’ competences in 3D field, the project can be also one tool which students with less opportunities and with scarce willingness to learn, can use in order to implement their interest in subjects that they consider as boring and no more useful. Increase students’ competences in emerging sectors such as 3D printers and increase their working opportunities in the labour market.